The Somerset Badger Group is committed to conserving, protecting and promoting badgers, their habitats and resting places, along with other native wildlife, by education to, and support for, the wider public. The Group was formed in 1989 by a group of wildlife enthusiasts particularly concerned for the welfare and conservation of badgers. The Group is run and funded by volunteers and has a widely respected reputation for dealing with all sorts of badger related issues. It works closely with the Police, RSPCA, Natural England, planning and local authorities, and in partnership with other wildlife conservation organisations. Since 2012 it has successfully run a badger vaccination initiative to support farmers who wish to combat Bovine TB in a sustainable way that does not include culling badgers. 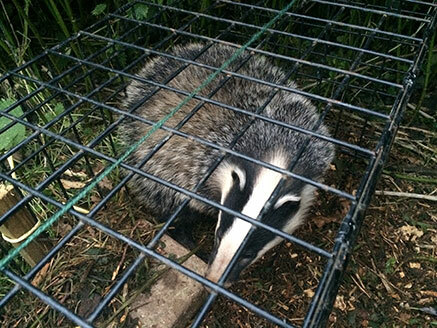 It has a 24/7 Helpline that deals with a wide range of calls for help and information, particularly badger rescues and wildlife crime incidents, where the group’s extensive experience is invaluable. Members enjoy a varied programme of events and regular training opportunities, and the Group supports and attends events arranged by other wildlife conservation organisations. New members are always welcome. 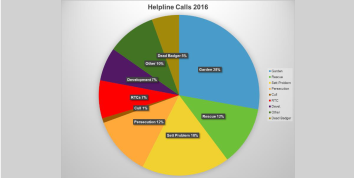 Somerset Badger Group has a 24/7 Emergency Helpline for reporting shot, sick or injured badgers who are in need of attention. Badgers and their setts are protected by the Protection of Badgers Act 1992. 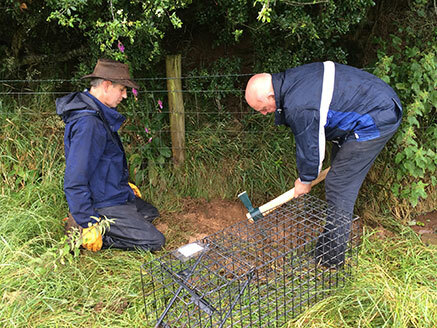 This protection resulted from historic persecution of badgers, particularly where badgers were dug out and then baited by dogs (badger baiting). Badgers are not protected because they are endangered. 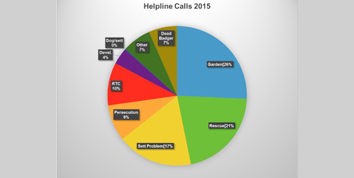 20% of calls made to the 24/7 Helpline relate to badgers needing rescue. The Group has a number of fully trained volunteers who are able to respond to these emergency calls for help. They rescue badgers injured on our roads or as a result of persecution, orphaned or lost cubs and badgers that are debilitated. The Group is dismayed at the levels of badger and other wildlife persecution that persists in both our countryside and urban areas. 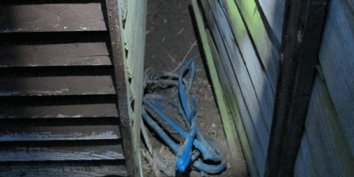 In many cases domestic pets suffer at the hands of the perpetrators. Reports of badgers being shot, snared, poisoned and gassed, and damage to and blocking of setts are unfortunately a regular occurrence. 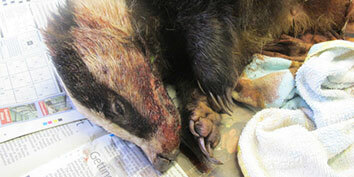 Read more about Badgers in need of help! The European badger (Meles meles) belongs to the family of mammals known as the Mustelidae which includes the otter, weasel, stoat, pine marten and polecat. Badgers are nocturnal, have a distinctive black and white face and live in family groups called clans in a system of underground tunnels and nesting chambers known as a sett. Badgers are low-set, have a distinctive black and white face and their body is normally silvery-grey with paler fur underneath. Adults are up to 75cm long with a short tail weighing on average 7-9kg in spring and 10-12kg in autumn. Badgers mate at almost any time of the year, but because of an unusual reproductive technique, known as delayed implantation, they have only one litter of normally 2 or 3 cubs a year. Most cubs are born between January and March, are about 120mm long and weigh around 75g to 130g. They are covered in greyish-white silky fur and their eyes stay sealed for the first few weeks whilst they are suckled by the sow in an underground chamber. After about 12 weeks the cubs will start to be weaned by the sow and begin following her to learn how to forage for food. Click here to see video of a sow with her 3 cubs. Although badgers are classified as carnivores their diet is very varied making them omnivores. When available earthworms make up the largest part of the badger’s diet, often as much as 60 per cent. They will also eat other invertebrates including slugs and snails, berries, fallen fruit, nuts, cereals, eggs, small mammals and birds (often taken as carrion) and they will dig out bees and wasps nests. Setts vary from a single-entrance to large multiple entrance complexes with large piles of spoil and worn paths. Badgers will collect bedding such as grass or leaves which they drag backwards to the sett often leaving bedding trails. Badgers usually defecate in dung pits, shallow holes a few centimetres deep. The colour and consistency of the faeces will vary depending on the type of food being eaten. Badgers are creatures of habit and follow the same musk-scented trails with paths leading from setts often worn smooth. 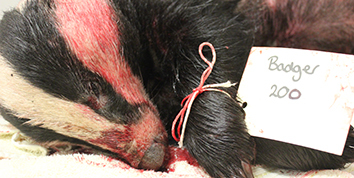 Badgers have five claws, longer on the front and a kidney-shaped central pad. Look for them in soft mud or soil. Long guard hairs which are coarse and have a short dark section close to a lighter tip can often be found in spoil heaps at setts or where badgers have pushed under obstacles such barbed wire fences. 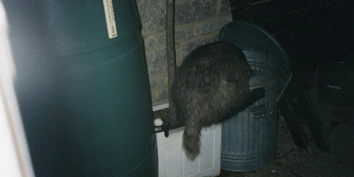 Badgers visiting gardens can be a wonderful opportunity to observe these amazing and resourceful animals. But sometimes they can cause problems. If you have a concern about badgers coming into your garden or if you think you may have a sett please call our 24/7 Helpline for help and advice. You can also click this link for additional information. If you want to feed badgers in your garden remember not to put too much out so they become dependent on your handouts. Badgers will eat peanuts, raisins, most soft fruits and bread spread with peanut butter and cut into small pieces. It is not advisable to put out sweet or dairy foods. Putting out fresh water, particularly during dry weather is also helpful. You can find tips on how to watch badgers and where to see them by clicking here. You can also visit us on YouTube by clicking here. Vaccination Results in 74% fewer badgers testing positive for Bovine TB and cubs born into vaccinated groups have 80% less chance of getting Bovine TB. 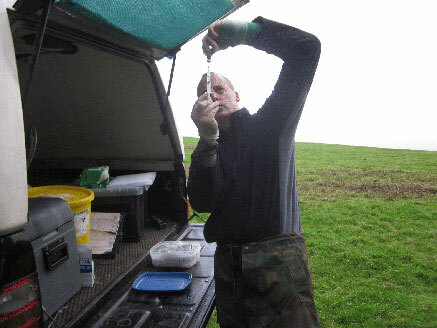 Somerset Badger Group set up a badger vaccination project in 2012 funded entirely by donations and under licence from Natural England the volunteers have successfully vaccinated 364 badgers in Somerset, Devon and Wiltshire across 19 sites totalling around 5500 acres including 9 commercial farms and a Somerset Wildlife Trust Reserve. 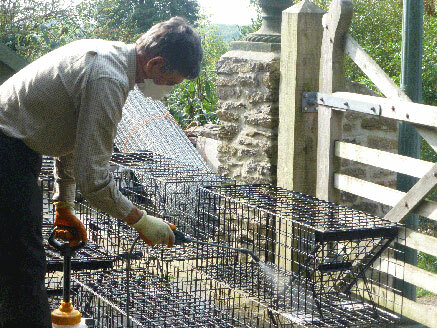 The original aim of the project was to offer farmers and land owners within the West Somerset cull area a responsible and cost effective alternative to culling. 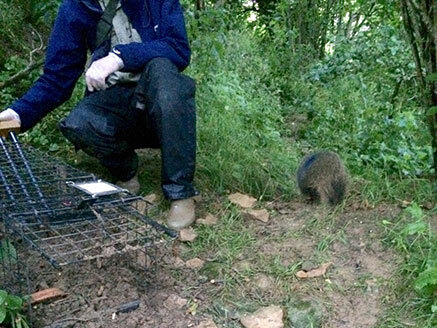 Since then interest from other areas has increased and the project has now expanded operation continuing to offer badger vaccination for a small charge based on each badger vaccinated. 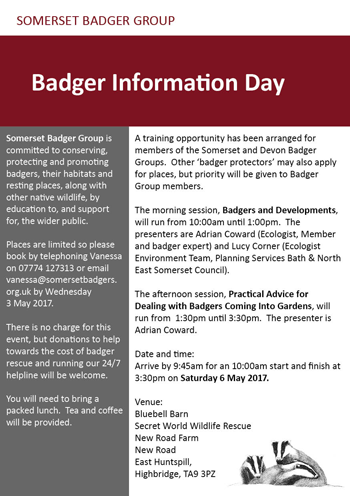 The money you donate will go towards the Somerset Badger Group vaccination & training programme. All vaccinations and training are carried out by volunteers who give their time for free. 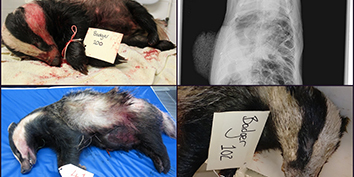 This amazing contribution, together with donations received, help the group to continue to offer responsible, cost effective badger vaccination. Badger culling has repeatedly been proved to be ineffective, inhumane, unsustainable and hugely expensive for taxpayers. 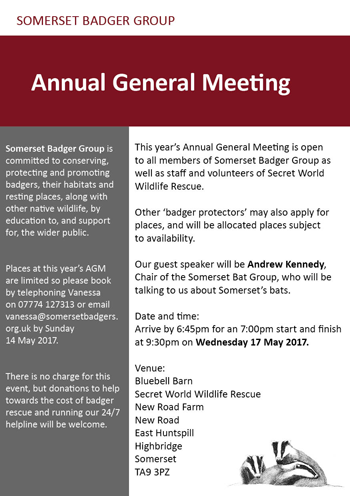 Get Involved with the Somerset Badger Group. Despite the findings of extensive, peer reviewed, scientific research (the Randomised Badger Culling Trial) which proved beyond doubt that culling badgers would make no meaningful contribution to controlling Bovine TB in cattle, the Government has persisted in rolling out the culls. The wider application of annual testing of cattle, improved cattle movement controls and improvements in farm bio-security has already seen real reductions of the disease in cattle. Over 80% of the British public are against the badger culls which have been proved to be inhumane, ineffective and very expensive for taxpayers. This genuine concern for badgers has seen people from all walks of life getting together to exercise their democratic right to protest sending a strong message to Government that badger culling is not the answer nor is it acceptable to a modern society. Regular training events are organised free for members and cover all aspects about badgers (some are listed below). Experienced members and specialist experts help with these events. Learn to understand the biology of badgers and how they behave. Appreciate how their behaviour can be interpreted from field signs so that a simple walk in the countryside can be enriched by understanding these signs and what they mean. 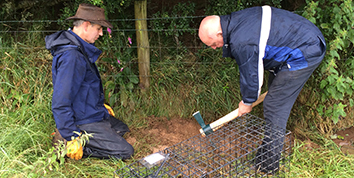 Search for badger setts and field signs with experienced surveyors. 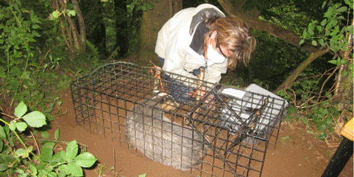 Record your findings to build up a picture of the badgers in your area. Learn about other wildlife, plants and habitats whilst outside. We even make sure you can read a map! Gain from understanding and how the legislation contained in the Protection of Badgers Act 1992, and other related wildlife legislation, is applied. Appreciate the benefits of working with the Police and RSPCA. 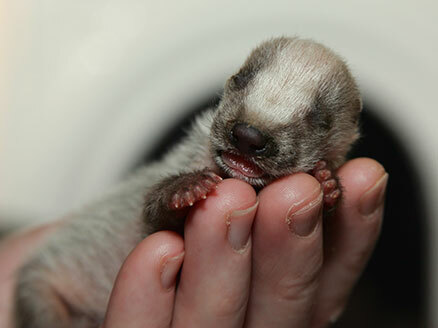 Learn how you can contribute to the protection of badgers and all wildlife. The Group is run entirely by volunteers who contribute time, expertise, funds and more to help the badgers and communities of Somerset. Everyone who would like to volunteer and support us is welcome and will always be able to contribute something that helps our aims and objectives. No matter how great or little the contribution it will be valued and helpful. We need a range of skills and attributes to support our work. Our membership spans a wide range of age and it has a multitude of abilities and experience. We are always very keen to help people grow in knowledge and confidence. We also encourage all members to involve their families and friends, and many of our activities and events are open to non-members. Anyone interested in joining us is welcome to come to a meeting or event without obligation. Try us and see before joining. 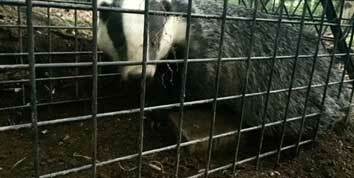 As a member of the Somerset Badger Group you would play a vital role in safeguarding Somerset’s badgers. With your help and support we will be able to help badgers by promoting their conservation, welfare and protection of badgers, their setts and their habitats. The money you donate will support the Somerset Badger Group conservation or vaccination programme. We’d like to credit the photographers who have kindly allowed us to use their photos for the website. They are: Alison Hickman, Dan Belton, Richard Peters and Secret World Wildlife Rescue.